I have a super easy and healthy recipe to "cleanse" away all the sweet goodies, deep fried dishes, and creamy potatoes that you might have indulged in this past weekend. Admittedly, I don't usually go all out during the Christmas season in terms of food and eating. I mean, if my family were to celebrate this holiday, then I'm sure self-control would be just a bit harder. However, if I do get to eat any special dishes during the holidays, then it's most definitely at church. Thus, although I don't normally indulge on Christmas day, yesterday I had some really good and new-to-me Philippino desserts at the church! Boy, they sure know how to make good treats. For example, I tried some of their Cassava cake, which is very similar to a dulce de leche flan, except that it is made out of Cassava and tapioca. This may just be my newest obsession. Before I share the detox salad recipe, let me share about my weekend first. Yesterday, Greg got yet another opportunity to speak at the church! For a reason that I will not be stating for Greg's sake, I will just tell you that I woke up at 5:30 am on Christmas morning and drove all the way to his apartment! I didn't wake up that early for presents either, mind you. I documented this very "special" moment just for you and me. I'm quite proud of myself that I woke up that early on a Sunday morning! It kind of has been forever since I've woken up that early. Isn't that so sad?! Anyway, when we finally had arrived to service, we were all filled with awe and wonder by the amazing gifts that every one of us has! In particular, half of the church members practiced their hearts out to sing ever so beautifully to honor Christ's birth. In the evening, G&I headed out to the movies (it's been forever!) and saw Mission Impossible 4. We both absolutely loved it! I am by nature a very "passionate" person, especially when it comes to intense thrillers like MI. You can say that I was probably THIS close from breaking Greg's fingers during all the scenes of suspense. Oops! This morning I made myself a bowl of the normal, yet always delicious oatmeal. In the mix there is rolled oats, mashed banana, ground flax, vanilla, cottage cheese, milk, and water. I had it with a side of Godiva's Hazelnut Crème homemade latte. Toppings included World Market's blood orange spread (which is so amazing btw), chocolate covered cookie, pound cake pieces, biscoff spread, blackberries, and Wild Squirrel's cocoa-nut peanut butter! This pb has made it even harder to choose my favorite out of all of the Wild Squirrel's products. Now onto the detox salad, shall we?! 2) For the vinaigrette, just throw all the ingredients into a processor or blender, and blend it until there are no big chunks remaining. And voilà! 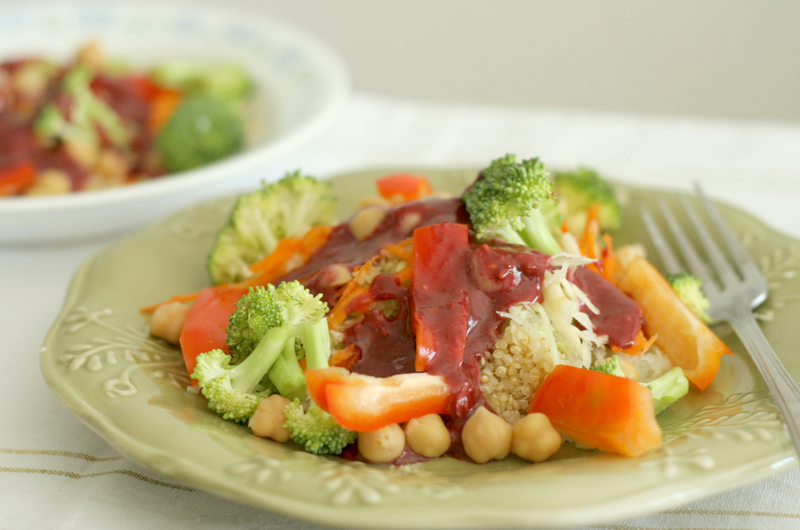 Put all of the vegetables, beans, and Quinoa on a plate, and drizzle on the vinaigrette. This salad is perfect either as a side dish or a hearty meal. It all depends if you double or triple the recipe. I loved that the dressing is light, slightly sweet, and perfectly tangy! Random: Oh yeah! I am pretty excited to use this cookbook I received from Sharon! It's the newest Betty Crocker book, and I love that it has so much variety in it! Remember that life is always an ongoing journey! Whether our goal is physical health, spiritual growth, faith in God, or even landing that dream job (or husband/wife), it is not about the mere fact that we get there. Rather, it's about how we get there. Every bit of that process matters, because it matters to God. I believe that it is beyond imperative for every one of us to constantly examine our hearts, and where we are in life. Sometimes we just have to turn down the noise in our lives and question ourselves why we do the things we do, or who we really are and strive to become. Have you tried Philippino food before? What's your fave recipe/dish? How was your Christmas? And what gift are you excited to use? In what ways will YOU turn down the noise in your life?